Earlier this week, Cody Rhodes addressed rumors of him returning to WWE and the future of the All In brand. On board the Jericho cruise, Cody assured the crowd that he will not be returning to WWE in 2019. He also promised to do everything in his power to make All In 2 a reality. According to the Wrestling Observer, there has been talk of holding two All In events in 2019. 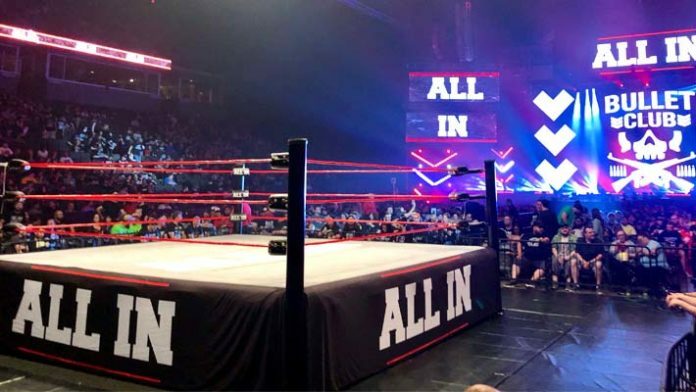 The Observer report says the next All In event would likely take place place over a holiday weekend somewhere on the West Coast. We’ve heard more specific details than this which are consistent with this report. Cody, The Young Bucks and the other organizers of All In 2 might have to proceed without the support of Sinclair and Ring of Honor. Not only did a lot of Ring of Honor performers work the show, but Sinclair was instrumental in providing crucial logistical support. ROH VP of Operations Gary Juster has been hailed as a “behind-the-scenes MVP” of All In. Juster, a former WCW executive, taught the crew about the inner workings of running a major live event. Will Ring of Honor be involved in future All In events? That seems unlikely. The company’s relationship with ROH will be very different come January. For much more on that situation, check out our exclusive report on what’s next for Cody and The Young Bucks.